Home » Concrete » Precast & Prestressed » Building Systems » Total Precast Structures » Building a Total Precast Structure? Strescon Limited can provide early and precise design assistance to help select the most efficient sizes and shapes for components, for structural efficiency and optimization for casting, transporting and erecting precast components. Member repetition reduces form costs and aids design speed while retaining design flexibility. These cost efficiencies can free up more of the budget for other critical design areas. Strescon Limited can provide finish samples, range samples and large-scale mockups, ensuring that design concepts translate into reality. Designers can inspect window interfaces, joint connections and other critical elements to ensure they are visually acceptable and will properly interface between trades. Plant visits to discuss technical and aesthetic concerns provide control without requiring constant site supervision. Because precast concrete pieces are fabricated in our precast plant under controlled conditions using high-quality materials, designs more exactly meet specifications. Field adjustments are reduced, creating a smooth erection process with minimal surprises. A total precast concrete system ensures one-stop shopping for the entire core/shell design. Strescon Limited can design and supply the entire system, generating a better coordinated set of drawings to allow construction to proceed more efficiently. This eliminates the added effort needed to coordinate various trades when using mixed systems controlled by different suppliers. 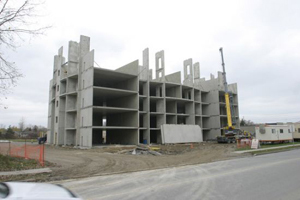 Precast/prestressed components are custom manufactured to match design requirements. Unusual shapes, sizes and specific technical requirements are expertly fabricated in our precast plant. Repetition of shapes and sizes will greatly enhance the economical use of precast components. 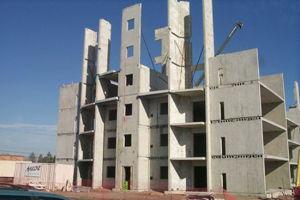 Precast's advantages are maximized when Strescon Limited is brought onto the design team early in the planning stage. This allows our company's full expertise in designing efficient shapes, textures and finishes to be exploited, as well as our state-of-the-art knowledge on connection and erection methods. 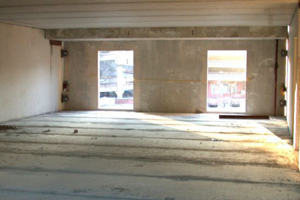 Precast hollow core flooring units provide long spans with cross-sections that reduce the height of the building, saving material cost, and their inorganic composition enhances fire protection. Strescon Limited can help determine which sizes, shapes and styles of components will best suit any individual commercial building project. Bringing Strescon Limited into the planning early in the design process will ensure the precast components maximize their effectiveness in aesthetic appeal, functionality and cost effectiveness.